Arising from a brief but wonkish post-round tea discussion. These are pharmacodynamic effects of antibiotics that inform both dosing and clinical decisions while treating bacterial infections, although they are not well known to most. Briefly, this is an observed phenomenon where there is delayed regrowth of bacteria after exposure to an antibiotic, even after the antibiotic concentration in the environment has dropped far below the level needed to inhibit the bacteria. Proposed mechanisms explaining this phenomenon include prolonged binding of the antibiotic to the bacterial target site as well as persistent non-fatal damage caused by the antibiotic. Type of bacteria. Gram-positive bacteria are affected by most antibiotics, while Gram-negative bacteria are not significantly affected by beta-lactam antibiotics. Class of antibiotics. Most pronounced with aminoglycosides. Presence of neutrophils. Absence of which shortens the duration of the postantibiotic effect for aminoglycosides and fluoroquinolines. The best known application of knowledge of this phenomenon is in aminoglycoside dosing. The plasma half-life of most current aminoglycosides is around 2 hours, but these drugs are effectively administered once daily even in persons with normal renal function. 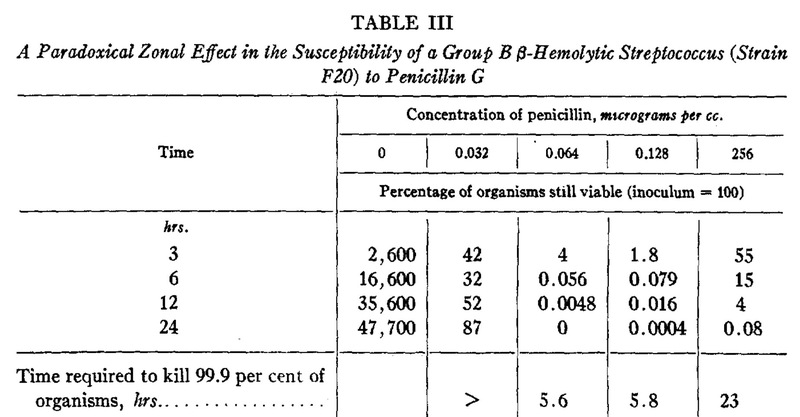 This was originally described by American doctor and pathologist Dr Harry Eagle in 1948 as a paradoxical phenomenon where the effectiveness of penicillin was reduced against various strains of streptococci, enterococcci and staphylococci when the drug concentration exceeded its optimal effective concentration. Forty years later, the term was invoked to describe the lack of efficacy of penicillin against Streptococcus pyogenes in a mouse model of myositis. An erroneous interpretation as far as I am concerned (this particular phenomenon is due to both the inoculum effect and also the lack of efficacy of beta-lactams against bacteria in their stationary growth phase), but it is this definition that has stuck. When I was training in infectious diseases, “Eagle effect” was the answer given to endorse the use of clindamycin in S. pyogenes necrotizing fasciitis (as an unrelated note, clindamycin is still being prescribed in Singapore for all sorts of non-S. pyogenes severe cellulitis and necrotizing fasciitis…), and it took quite a number of years before I read the original 1948 paper.